Last week it was announced that the City of Asheville will have to make drastic reductions in their plans that were meant to improve 2.2 miles on Riverside Drive along the French Broad River because the actual construction bids came in at double the amount to taxpayers than the City estimated. This project is called "RADTIP" which stands for River Arts District Transportation Improvement Project. The original figure was $26 million from the City taxpayers plus $24 million from grants for a total estimated cost of $50 million. The new figure? Double the portion from city taxpayers to $52 million for a grand new total of $76 million. Since the City doesn't have an additional $26 million, it has to scale back, reduce, cut its plans or what the City has coined "value engineer" the entire RADTIP project. This is the latest and largest example of gross mismanagement by our City Manager, Gary Jackson (who earns $220k a year) and the ineptitude of our City Mayor, Esther Manheimer and this current slate of City Council members who cannot or will not hold Gary Jackson and other staff accountable or responsible for such a gross error. Instead, they all get a 2.5% raise this year and a slap on the wrist. "If you think your number $60 million is going to hold up in a construction business that annually goes up 10% then you need to be working in a construction company." 1) The final cost will probably be around $100 million. There isn't a project he's managed that hasn't cost double the original estimate. 2) It will probably take 6 years to complete, not the estimated 3. 3) There will be a major problem uncovered that will delay and cost taxpayers even more. 4) Lastly, Gary Jackson will have to resort to generating more debt to cover his mistakes. It appears that hints of this are already being introduced as one council member is already suggesting using the $74 million worth of bonds that were approved last November. Keep in mind though, that those bonds were earmarked (at least that is what they were sold to the public on) for many other city projects - not this one. UPDATE 6.28.2017 - It appears the taxpayer debt is already getting higher. At last night's City Council meeting, the Council approved an additional $4.7 million in debt proceeds for the project. In other media articles and during last night's City Council meeting the City staff were "shocked" and surprised by this turn of events. Council is proclaiming ignorance; that they were not informed. Not so. The River and RADTIP has become the City's ultimate ponzi scam scheme to bilk grant monies from organizations and triple the City's debt load in a flood prone zone and it all started with beer that turned into champagne and then went sour. New Belgium Brewery - the "Catalyst"
In April 2012, New Belgium announced Asheville as its east cost brewery and distribution site. This became the "catalyst" for the City of Asheville to apply for a Federal Highway Grant to widen the road along Riverside Drive and lower the road at the Norfolk Southern Trestle Bridge in order to accommodate New Belgium's trucks. This coalesced into a shared vision when the City obtained the Federal Tiger VI Grant of $14.6 million in September 2014. As stated by Mr. Jackson, the City then used that grant award to convince other county/state/tourism development authorities and organizations to contribute to the rest of their plans to clean up the industrial/artsy River Arts District and turn it into a new urbanized riverfront development oasis, complete with greenways, parks, new pedestrian bridges, "multimodal improvements" and even a new form based code designed to keep out any new industrial businesses. Over time, the City was able to eke out an additional $10 million in grants from these other organizations. At this point the total estimated cost was $50 million of which City taxpayers would contribute $26 million and the remainder would come from the grants and the Tiger VI monies. Though New Belgium assisted the City in whenever and however it could, it simply was not enough. 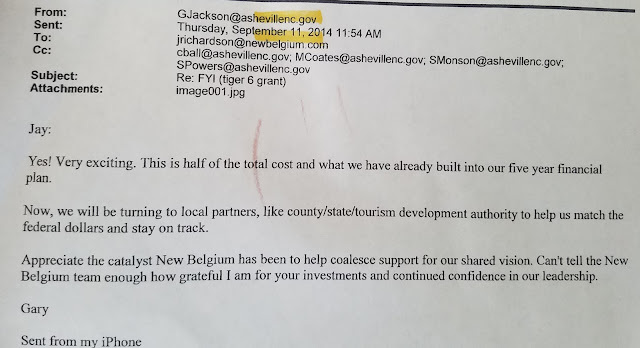 They even supported Asheville on Bikes' petition to have protected bike lanes rather than just standard bike lanes although it would cost an additional $1 million. The City approved that change in the nick of time (July 2015). 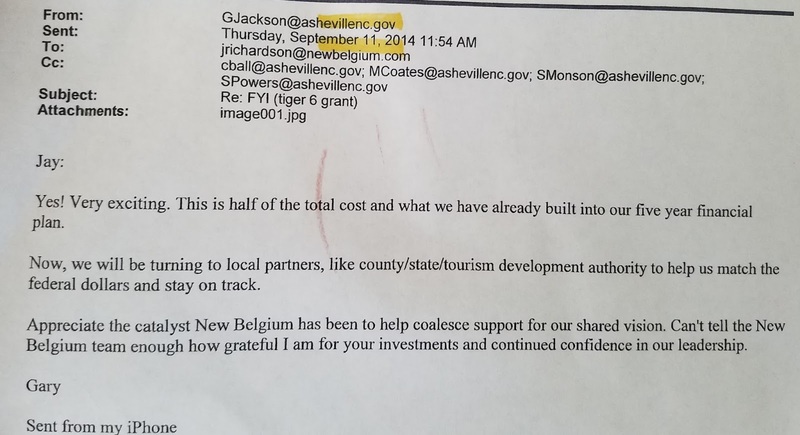 Despite all of that, it turns out the estimated $50 million was not enough to meet the demands of Asheville's champagne taste for luxury bike lanes and greenways. Those protected bike lanes are getting cut. A wannabe developer, the City of Asheville just doesn't understand construction. Since 2012, the City has already expended $13 million toward this ponzi scam scheme known as RADTIP. City Manager, Gary Jackson, used it to convince other organizations to give money toward this project. That's $13 million that could have been used on other, more important priorities. City leaders diverted their priorities and the budget from other areas of the City to this 2.2 mile stretch. They prioritized bike lanes ahead of bus transit and needed sidewalk and road repairs and greenways ahead of public safety. The City has further increased fees and charges and then diverted those to the River area money pit - major amounts of stormwater fees are going to the river for flood mitigation - why? BECAUSE IT FLOODS! Taxpayers need to demand the resignation of Gary Jackson and stop his tax and spending spree. Taxpayers need to hold this Council accountable in this next election and elect members of the community that will hold City staff accountable and priorities in line. Taxpayers, no matter what, do not allow the City Council to divert the use of the $74 million bonds from the original slated projects to pay for these river mistakes. They will do it if you don't. We guarantee it.